Background Chronic lymphocytic leukemia (CLL) is a clinically heterogeneous disease. Some patients exhibit an indolent disease without requiring therapy, whereas others show rapidly progression and die within months. The Rai and Binet staging systems are unable to predict disease progression in the early stages. Aim The aim of this study was to evaluate the clinical value of activation-induced cytidinedeaminase (AID) mRNA expression in predicting disease progression in early stages and response to therapy in later stages of CLL. Patients and Methods We assessed AID mRNA expression by quantitative real-time PCR in 42 patients with B-CLL. Results High AID expression was associated with shorter duration for the need to start antileukemic treatment in patients with earlystage CLL. Moreover, high AID expression was also found in patients not achieving complete remission or nonresponding to treatment. Conclusion AID could be used to predict early disease progression and was shown to be relevant in predicting responsiveness to antileukemic treatment in CLL cases. Chronic lymphocytic leukemia (CLL) is a clinically heterogeneous disease. Some patients exhibit an indolent disease, whereas others show rapidly progressive disease (PD) and die within months . The Rai  and Binet  staging systems are useful for predicting survival in patients with CLL. However, they are unable to predict disease progression in the early stages. Recently, several studies ,, have revealed a strong and independent prognostic value of the immunoglobulin heavy chain variable region gene (IgVH) mutation status that can predict early-stage disease progression. However, the mutation assay is both expensive and difficult to perform in a routine laboratory . Activation-induced cytidine deaminase (AID), which converts cytosine into uracil, is expressed by activated B lymphocytes and plays a role in the process of somatic hypermutation (SHM) and class switch recombination , suggesting its potential association with IgVH gene mutational status . The goal of this study was to evaluate the clinical value of AID mRNA expression in predicting disease progression in early stages and response to therapy in later stages of CLL. The present study was carried out on 42 patients with newly diagnosed B-CLL. Cases were selected from the Hematology Department, Medical Research Institute, Alexandria University, and Mostafa Kamel Military Hospital. An informed written consent was obtained from all patients before the study, according to the ethical guidelines of the Medical Research Institute Alexandria University (Appendix 1, informed written consent for patient participation in a Clinical Research 2011). The study was conducted in accordance with the local ethical committee, and Informed consent was obtained from all patients included in the study. Twenty-two (52%) patients were males and 20 (48%) were females, and their age ranged from 50 to 74 years (mean 61.5±6) years. Fifteen (36%) patients were in Binet stage A, whereas 16 (38%) and 11 (26%) patients were in Binet stages B and C, respectively. The diagnosis and treatment of CLL were based on the ESMO Clinical Practice Guidelines for diagnosis, treatment, and follow-up . Bone marrow trephine biopsy was performed in 28 cases. The pattern of infiltration was divided into nondiffuse (nodular, interstitial, or both) and diffuse. At diagnosis, patients were stratified into two groups according to the absence (group I=15 patients) or presence (group II=27 patients) of an indication to start antileukemic treatment. Group I patients were followed up for the study period and antileukemic treatment was started whenever indicated. Group II patients were divided into two subgroups according to the received antileukemic protocol. Group IIA patients (N=13) received fludarabine+cyclophosphamide (FC) protocol . The cycle was repeated every 28 days until achieving the best response, not exceeding 1 year of therapy. Group IIB patients (N=14) received oral chlorambucil 0.3 mg/kg/day for 5 consecutive days every 28 days with or without prednisolone  until achieving the best response, not exceeding 1 year of therapy. In both groups of patients, dose modifications of the antileukemic drugs were considered in view of grades of the adverse events. The best achieved response of these therapeutic protocols was evaluated according to the criteria of NCI-WG on CLL . Complete remission (CR) was defined as disappearance of constitutional symptoms and organomegaly with normalization of peripheral blood count. Partial remission (PR) was considered as more than 50% improvement in peripheral blood count and organomegaly. Progressive disease (PD) is the increase in stage and/or indication for starting therapy. Stable disease (SD) is a state where the patients did not fit the criteria of CR, PR, or PD. GAAGGTGAAGGTCGGAGTC, reverse primer: GAAGATGGTGATGGGATTTC, and TaqMan probe=FAM-CAAGCTCCCGTTCTCAGCC-TAMRA, and for AID, forward primer=CCTCCTAATGAGATATCTGGGTGAT, reverse primer=TTAAAACATACAGGGCATGATTGG, and TaqMan probe=FAM-TGACCCCAAACCATCTCTCCAAAGCA-TAMRA. PCR was carried out in a 25-μl reaction volume. The thermal cycler conditions were 50°C for 2 min, 95°C for 10 min, and 45 cycles of 95°C for 20 s and 60°C for 1 min. Data were analyzed using the computer software provided for Stratagene MX3000 real-time PCR analyzer (Qiagen). Results were obtained as CT (threshold cycle) values. The difference between the AID and GAPDH reactions CT values (ΔCT) was converted into AID expression units. The χ2-test was used to determine the significance between variables. Treatment-free survival (TFS) and duration of response to chlorambucil (DR) were estimated by the Kaplan–Meier method and compared by means of the log-rank test. P-value of up to 0.05 was considered significant. TFS was defined as the length of time from the diagnosis to start of antileukemic treatment in group I patients, and DR as the length of time after primary antileukemic treatment that the patient survives in CR or PR. All statistical analyses were performed using the statistical package for the social sciences (SPSS software version 24.0; SPSS IBM Corp., Armonk, New York, USA). Youden’s index was used to assess the optimum cutoff point for AID expression as a predictor of need for treatment and as a predictor of treatment responsiveness. Sensitivity, specificity, positive predictive values, negative predictive values, and accuracy were assessed to summarize the ability of AID to predict need for treatment and/or treatment response . AID mRNA expression was positive in all studied cases. AID mRNA expression levels were significantly higher in high-risk stages patients (stages B and C) than in low-risk stage patients (stage A) (P=0.011). No statistically significant correlations were found between AID and hemoglobin level (P=0.180), platelet count (P=0.243), white blood cell count (P=0.323), absolute lymphocytic count (P=0.331), and β2-microglobulin (P=0.245). However, AID showed significant positive correlation with lactate dehydrogenase (P=0.036). Regarding the type of infiltration in bone marrow biopsy, there was no significant difference in AID expression between diffuse and nondiffuse infiltration (P=0.195). Of 15 (40%) patients who did not show indication to start therapy at diagnosis, six exhibited an indication for starting treatment during the study period. The median follow-up period from diagnosis was 20 months. AID expression levels in these patients who became in need for treatment were significantly higher (median=14.96 U) than in patients who did not show indication to start antileukemic therapy (median=0.54 U) (P=0.049). A number of cutoff values were investigated for AID using the Youden’s index to predict the need for treatment in this group of patients. The highest Youden’s index was 0.5, showing two cutoff values (5 and 20 AID expression units). A cutoff value of five AID expression units was chosen for its higher sensitivity (83%), with 67% specificity, 63% positive predictive value, 86% negative predictive value, and overall accuracy of 73% ([Table 1]). The estimate mean TFS of group I patients was 16.30 months, with 95% confidence interval (CI): 12.3–20.3, for patients having AID expression above five expression units and 30.25 months with 95% CI: 27–33.5 for patients having AID expression less than five expression units, showing a statistically significant difference (P=0.016) ([Figure 1]). Figure 1 Treatment-free survival (in months) of group I patients regarding activation-induced cytidine deaminase (AID) expression level (above and below the cutoff value). Of 13 patients receiving FC protocol, eight (61.5%) patients achieved CR, and five (38.5%) patients achieved PR. AID expression was significantly higher (mean: 2101 U, range: 126.9–8409) in those patients who did not achieve CR than in patients who achieved CR (mean: 43.8 U, range: 0.02–262.8) (P=0.005). Of the 14 patients of group IIB (receiving chlorambucil), two (14.3%) patients achieved CR, seven (50%) patients achieved PR, and two (14.3%) patients showed SD, whereas three (21.4%) patients had PD. AID expression showed significant association with responsiveness to therapy, being higher in nonresponsive patients (SD and PD) (mean: 10376.7 expression units; range: 96.2–20 420) than in responsive patients (CR and PR) (mean: 1285.5 U; range: 0.003–6830) (P=0.029). A number of cutoff values were investigated for AID using the Youden’s index to predict response to therapy in this group of patients. A cutoff value of 4000 AID expression units was chosen with 80% sensitivity, 89% specificity, 80% positive predictive value, 89% negative predictive value, and 86% accuracy. The cutoff value of AID expression, which was chosen to predict treatment response (4000 expression units), was also used to estimate the DR in group IIB patients with CLL. 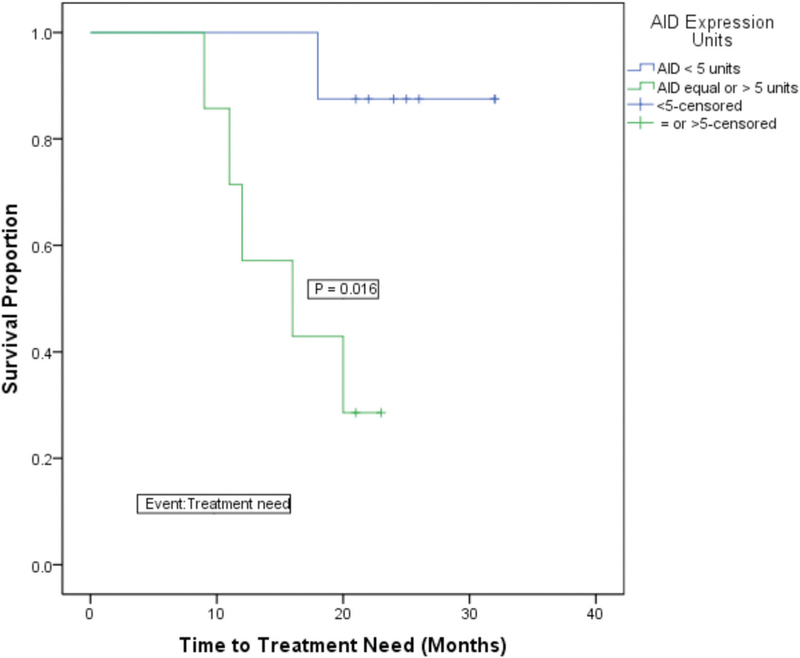 The estimate mean DR was 15.5 months (95% CI: 5.5–25.5) for patients having AID expression units above 4000 and 25.6 months (95% CI: 17.9–33.3) for patients having AID less than 4000 expression units, with no statistically significant difference (P=0.244) ([Figure 2]). Figure 2 Duration of response to chlorambucil (in months) of group IIB patients regarding activation-induced cytidine deaminase (AID) expression level (above and below the cutoff value). The expression of AID mRNA using QRT-PCR was detected in all our patients with CLL with a wide range of expression. In comparison with the present results, Albesiano et al. and McCarthy et al. demonstrated AID mRNA positivity in 100 and 95% of the studied patients with CLL, respectively, using QRT-PCR. In contrast, Heintel et al. showed that only 56% of patients were positive for AID mRNA using the same technique. This difference in results may be attributed to the QRT-PCR protocol, where the amplification cycles were 40 cycles in the study of Heintel et al. , whereas 45 cycles were adopted by our series. Such lower number of amplification cycles can decrease sensitivity as very low AID expression would be strongly assigned as negative. In the present work, higher AID expression showed a significant association with advanced Binet stages, which is in agreement with that reported by Hancer et al. . However, no correlation was found with the hematological parameters (white blood cell and absolute lymphocytic counts, hemoglobin level and platelet count). Regarding markers of tumor burden, AID expression correlated positively with lactate dehydrogenase, whereas no significant correlation was found with β2-microglobulin. These results parallel the previous findings of Heintel et al. . In this respect, several studies ,, demonstrated that AID may initiate DNA breaks, and high levels are associated with deletions in DNA regions of 17p13, 11q22.3, or 13q14 that are associated with poor prognosis in patients with CLL. The effect of AID expression on the clinical course of CLL, in the current study, was investigated in terms of the need for treatment, the response to therapy, as well as the duration of treatment response. High expression of AID mRNA was associated with treatment requirement. This led to the evaluation of candidate cutoff values of AID expression using Youden’s index for the prediction of need for treatment. The best cutoff value was five AID expression units for its higher sensitivity. Cases with less than five expression units had a higher TFS than those with more than five units. No indexed reports studied the association of AID with TFS in patients with CLL, and the presented cutoff value of AID expression is put forth awaiting further evaluation. Actually, Heintel et al. demonstrated an association between AID expression and unmutated IgVH gene. Here, a question was raised: If the presence of AID is so long necessary for the presence of SHM, why high expression of AID is associated with unmutated IgVH gene? In a trial to explain this, McCarthy et al. and Marantidou et al. reported that unmutated CLL cases expressed two mRNA splice variants of AID. The splice variants differ from the wild-type AID in the carboxyl terminal region that is believed to be involved in substrate binding, so it is possible that the wild-type AID/splice variant dimers would fail to bind the AID substrate, thus unable to produce SHM and account for the absence of IgVH gene mutations in unmutated CLL despite high levels of AID mRNA. Whether the association between AID expression and unmutated IgVH gives AID the same prognostic power of the mutational status or not remains to be evidence proven. Treatment deferral in patients who did not meet the recommended indications for starting antileukemic therapy was evidence proven, because the survival rate was not increased in patients with early-stage disease who received chlorambucil in respect to those who did not receive treatment . At the present time, it is still not obvious whether starting antileukemic treatment will be superior to observation in such group of patients. Moreover, still there are no firm data supporting treatment of this group of patient (who are not indicated to receive treatment) when they have unfavorable prognostic markers.In the present study, the overall response rate (OAR) was 100% in the group IIA patients who received FC protocol, with 61.5% achieving CR. In agreement with our results, Flinn et al. and Eichhorst et al. reported an OAR of 100 and 94%, respectively. However, they described lower CR rates (21–47%), and this could be attributed to the small number of patients in the present series. It was found that AID expression in this group of patients was significantly associated with the type of response to antileukemic therapy, being lower in patients achieving CR. In group IIB patients (who received chlorambucil), the OAR was 64%, with 14% of patients achieving CR and 36% were nonresponders (SD and PD). In parallel with these results, Mabed et al. reported an OAR to chlorambucil of 47.7% with 12.8% of patients achieving CR and the nonresponders constituted 40.4% of patients. In this concern, AID expression showed significant association, being higher in nonresponders. The present work presented a cutoff value of AID expression (4000 U) to predict the response to chlorambucil in this group of patients. AID expression above this value could predict refractoriness to chlorambucil therapy. In this concern, no indexed reports studied the association of AID with treatment responsiveness in patients with CLL, and again, the presented cutoff value of AID expression is put forth awaiting further evaluation. 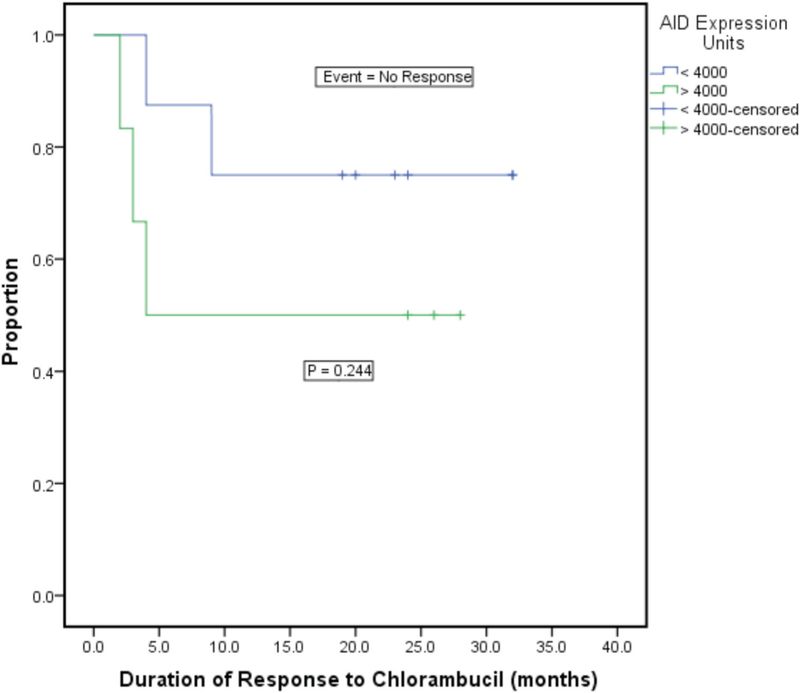 It was also found that although the mean duration of response to chlorambucil in patients with less than 4000 AID expression units is higher than in patients with more than 4000 U, this did not reach the level of significance, which may be because of the small number of patients. Interestingly, AID showed a significant association with treatment response, whatever the used protocol, FC or chlorambucil. Although these antileukemic protocols are quite different regarding response rates, AID expression retained its association with the response in both groups. In addition, although OAR was 100% in group IIA, AID expression retained its significant association with the type of response (CR vs. no CR) with higher values precluding achieving CR. AID could be used at the time of diagnosis to predict early disease progression and was shown to be relevant in predicting responsiveness to antileukemic treatment in CLL cases. Awan FT, Byrd JC. Chronic lymphocytic leukemia. In: Kaushansky K, Lichtman MA, Prchal JT, Levi MM, Press OW, Burns LJ, Caligiuri MA, editors. Williams hematology. 9th ed. New York, NY: Toronto McGraw Hill Education; 2016. pp. 1527–1552. Rai KR, Sawitsky A, Cronkite EP, Chanana AD, Levy RN, Pasternack BS. Clinical staging of chronic lymphocytic leukemia. Blood 1975; 46:219–234. Binet JL, Auquier A, Dighiero G, Chastang C, Piguet H, Goasguen J et al. A new prognostic classification of chronic lymphocytic leukemia derived from a multivariate survival analysis. Cancer 1981; 48:198–206. Nabhan C, Raca G, Wang YL. Predicting prognosis in chronic lymphocytic leukemia in the contemporary era. JAMA Oncol 2015; 1:965–974. Szankasi P, Bahler DW. Clinical laboratory analysis of immunoglobulin heavy chain variable region genes for chronic lymphocytic leukemia prognosis. J Mol Diagn 2010; 12:244–249. Kharfan-Dabaja MA, Chavez JC, Khorfan KA, Pinilla-Ibarz J. Clinical and therapeutic implications of the mutational status of IgVH in patients with chronic lymphocytic leukemia. Cancer 2008; 113:897–906. Kumar R, DiMenna LJ, Chaudhuri J, Evans T. Biological function of activation-induced cytidine deaminase (AID). Biomed J 2014; 37:269–283. Heintel D, Kroemer E, Kienle D, Schwarzinger I, Glei A, Schwarzmeier J et al. High expression of activation-induced cytidine deaminase (AID) mRNA is associated with unmutated IGVH gene status and unfavourable cytogenetic aberrations in patients with chronic lymphocytic leukaemia. Leukemia 2004; 18:756–762. Eichhorst B, Robak T, Montserrat E, Ghia P, Hillmen P, Hallek M, Buske C et al. Chronic lymphocytic leukaemia: ESMO Clinical Practice Guidelines for diagnosis, treatment and follow-up. Ann Oncol 2015; 26:v78–v 84. Catovsky D, Richards S, Matutes E, Oscier D, Dyer MJ, Bezares RF et al. Assessment of fludarabine plus cyclophosphamide for patients with chronic lymphocytic leukaemia (the LRF CLL4 trial): a randomised controlled trial. Lancet 2007; 370: 230–239. Rai KR, Peterson BL, Appelbaum FR, Kolitz J, Elias L, Shepherd L. Fludarabine compared with chlorambucil as primary therapy for chronic lymphocytic leukemia. N Engl J Med 2000; 343:1750–1757. Hallek M, Cheson BD, Catovsky D, Cappio C, Dighiero G, Döhner H et al. Guidelines for the diagnosis and treatment of chronic lymphocytic leukemia: a report from the International Workshop on Chronic Lymphocytic Leukemia updating the National Cancer Institute-Working Group 1996 guidelines. Blood 2008; 111:5446. Wong ML, Medrano JF. Real-time PCR for mRNA quantitation. BioTechniques 2005; 39:75–85. Bewick V, Cheek L, Ball J. Statistics review 13: receiver operating characteristic curves. Crit Care 2004; 8: 508–512. Albesiano E, Messmer BT, Damle RN, Allen SL, Rai KR, Chiorazzi N. Activation-induced cytidine deaminase in chronic lymphocytic leukemia B cells: expression as multiple forms in a dynamic, variably sized fraction of the clone. Blood 2003; 102:3333–3339. McCarthy H, Wierda WG, Barron LL, Cromwell CC, Wang J, Coombes KR et al. High expression of activation-induced cytidine deaminase (AID) and splice variants is a distinctive feature of poor-prognosis chronic lymphocytic leukemia. Blood 2003; 101:4903–4908. Hancer VS, Kose M, Diz-Kucukkaya R, Yavuz AS, Aktan M. Activation-induced cytidine deaminase mRNA levels in chronic lymphocytic leukemia. Leuk Lymphoma 2011; 52:79–84. Hasham MG, Snow KJ, Donghia NM, Branca JA, Stavnezer LJ, Shopland LS et al. Activation-induced cytidine deaminase-initiated off-target DNA breaks are detected and resolved during S phase. J Immunol 2012; 189:2374–2382. Gelmez MY, Teker ABA, Aday AD, Yavuz AS, Soysal T, Deniz G et al. Analysis of activation-induced cytidine deaminase mRNA levels in patients with chronic lymphocytic leukemia with different cytogenetic status. Leuk Lymphoma 2014; 55:326–330. Leuenberger M, Frigerio S, Wild PJ, Noetzli F, Korol D, Zimmermann DR. AID protein expression in chronic lymphocytic leukemia/small lymphocytic lymphoma is associated with poor prognosis and complex genetic alterations. Mod Pathol 2010;23:177–186. Marantidou F, Dagklis A, Stalika E, Korkolopoulou P, Saetta A, Anagnostopoulos A. Activation-induced cytidine deaminase splicing patterns in chronic lymphocytic leukemia. Blood Cells Mol Dis 2010; 44:262–267. Barrientos JC. Management of chronic lymphocytic leukemia in the elderly. management of chronic lymphocytic leukemia in the elderly. Cancer Control 2015; 22:17–23. Flinn IW, Kumm E, Grever MR, Neuberg D, Dewald GW, Bennett JM et al. Fludarabine and cyclophosphamide produces a higher complete response rate and more durable remissions than fludarabine in patients with previously untreated CLL: intergroup trial E2997. Blood 2004; 104:475. Eichhorst BF, Busch R, Hopfinger G, Pasold R, Hensel M, Steinbrecher C et al. German CLL Study Group. Fludarabine plus cyclophosphamide versus fludarabine alone in first-line therapy of younger patients with chronic lymphocytic leukemia. Blood 2006; 107:885–891. Mabed M, Aref S, Fouda M, El-Sharawy S. Chlorambucil plus theophylline vs chlorambucil alone as a front line therapy for B-cell chronic lymphatic leukemia. Leuk Lymphoma 2004; 45:2029–2035.